INDIANAPOLIS — Roger Penske has a very simple solution for the predicament the Indianapolis 500 created when one of its most popular drivers, James Hinchcliffe, was bumped from the field during qualifying last weekend. Teams that run the entire season should be guaranteed spots in the biggest race of the year. "As I look at it now," the Hall of Fame team owner said, "with sponsors being so important and the teams building up for Indianapolis, and that really being the hallmark of probably your sponsorship running at Indy, it's a real tough pill to take if you don't make the race." Indeed, one of the largest tents on the infield of Indianapolis Motor Speedway carries the logo of Arrow Electronics, the primary sponsor on Hinchcliffe's car for Schmidt Peterson Motorsports. Hinchcliffe is also one of the faces of IndyCar, not to mention engine supplier Honda and several other sponsors, and commercials featuring him continued to air even after he missed the field. 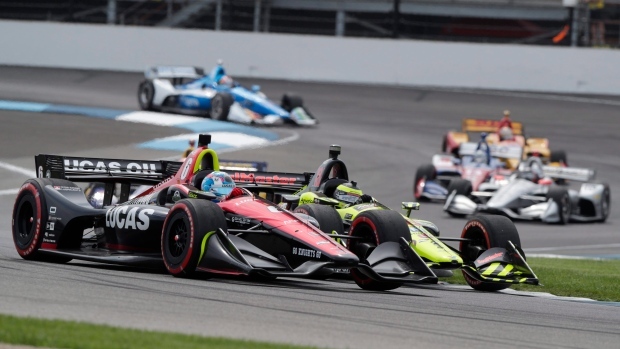 "I think we need to step back and look at this and be sure that people who commit for a full season know they have a place in the Indy 500," Penske said, "because the world has changed." NASCAR learned long ago the importance of keeping sponsors happy. So while it's common to have more cars attempt to qualify on a week-to-week basis than could fit in its field, the sanctioning organization implemented a charter system that assures a spot for the full-time teams. Purists might argue that bump day is a part of the Indy 500 mystique, and that it adds a crucial wrinkle of drama to qualifying weekend. The race against the clock to make the field of 33 can be just as heartbreaking as anything that happens when the green flag drops Memorial Day weekend. Penske has experienced that heartache, missing out on the field entirely one year. He understands the importance of keeping bump day alive, and the fact that 35 cars were vying for 33 spots shows the health of the sport. But he also thinks there could be a compromise where perhaps the last 10 or so spots — after the full-time teams get theirs — would be left open for anyone to grab. "I don't think anybody would think we're breaking with tradition," said Penske, adding that already he's spoken with Hulman & Company CEO Mark Miles and IndyCar President Jay Frye about potential changes. "In '94 we didn't make the race. I remember walking out of pit lane with 100,000 people qualification day and going back to my garage and it was a real blow," Penske said. "On the other hand it made us better going forward. This is a place you want to race and you have to be there going in." Guaranteed spots isn't the only idea that has floated through the garage area. Several drivers mentioned eliminating double points for the Indy 500 — or eliminating points entirely — which would have made the blow to Hinchcliffe's team a bit more palatable. Others said they wanted a true bump day to return to Indy, where the field is set Saturday with the last few spots available Sunday. That would also make it more likely for the top teams to survive. "It's so exciting to watch, just unbelievable," 2014 series champ Will Power said. "Very sad for Hinchcliffe. He's in the championship and it's a double points race and he doesn't get to race. But on the other hand, you can't take all this lightly. There are serious consequences for small mistakes." Penske would just prefer the consequences be a bit less serious. "I feel good about what's going on with the cars, the technology, the cost," he said. "I think this is just one thing they're going to have to tweak."